Are you ready for a wonderful spring? There's something special about the warmth of the sun that has been absent for months. It breathes new life into us, ignites a spirit of "doing" and makes us want to make everything new. Spring cleaning isn't a new concept by any means, but viewing your entire life as something you can "spring clean" may be a new idea to you. Using this season as one to reevaluate the old and breathe in the new just feels so natural and satisfying. 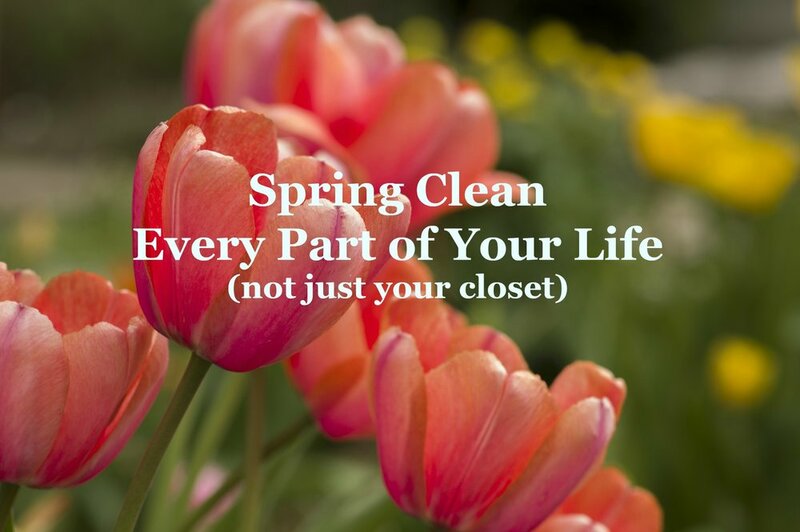 If you’re wondering what you can do to spring clean your life, here are some great suggestions! I know this is the one you expect this time of year, but decluttering your living space and giving it a good deep clean can change the entire feel of your home. Renewing your sacred space can rejuvenate you in many ways, bringing a lighter, happy feeling as the sunshine rolls in with spring. So tuck away all those winter clothes, give your living space a refresh and start Spring on a clean foot. Have you been doing the same old fitness routine all winter? It can get monotonous, not just for you but also for your muscles that get used to it, too. Shake things up by taking a new class, trying yoga classes at the new studio in town, doing a new workout video you’ve never tried, or jogging down a new trial. I'm confident you have the itch to spend more time outdoors in the warmer weather, so the change will do you good! Whether that be negative people in your life or simply bad habits that you have been meaning to finally kick, use this time as an opportunity to get rid of anything that has been bogging you down. What comes to mind immediately when you read this? Chances are, that's precisely what you need to work on releasing. When you are doing this important work of releasing negativity, take the opportunity to replace negatives in your life with something positive. When you aren't at work, take time off from as much technology as possible. Use the time to connect with people face-to-face -- meet your friends for lunch, read a book, explore a new area, or do anything that keeps you from continually being glued to a screen. You’ll feel loads happier when you do. Even if you start with a set amount of screen-free hours per day, you'll be making a huge difference in your relationships and happiness levels. It's the perfect time to give your eating habits a makeover, too. Take notice of how you feel on a daily basis, are you feeling energized? Sluggish? Exhausted by 4 pm? What you're eating is a tremendous piece of the answer, whatever you may be feeling. If sluggish is more normal than energized for you -- start by incorporating more whole foods into your daily routine. Phase out the processed foods one by one, replacing them with healthier option. Living paycheck to paycheck is a reality much of the population faces. A lot of the time, these situations aren't easy to fix, but we can always be making some movement toward improvement. That's what this spring renewal is all about, so take this chance to take a good look at your financial situation and notice what improvements can be made. See what extraneous expenses can be cut, how you can begin saving more for a rainy day, and what areas you can use your financial resources to give back to those in need. If you don’t have a hobby, or you’re feeling like it’s the perfect time to try something new, now is the prime time. Try a painting or cooking class, learn a new language, or discover something else you’ve always wanted to try. It’s invigorating to fuel our quest for creativity. And above all, treat yourself. Find things that make you come alive, feel creative, and seek playfulness. Take action now and leave a comment below on what part of your life you're going to tackle first and spring clean. Do you ever feel like you’ve simply run out of meal ideas? You might cook the same five dishes over and over, just like the majority of us or you’re just not inspired to cook anything. Your schedule is full enough, and having the time to get creative in the kitchen seems like a pipe dream. This is where the crockpot/slow cooker is a dream come true. Toss in your ingredients in the morning, go to work, and come home to a healthy, delicious, hot meal for you and your family. You have enough on your shoulders already...let me help you figure out what’s going to be on your plate. Over the next three weeks, I’m giving you a recipe a week for you to try. They’re extremely healthy and hopefully inspire you in your kitchen. Add all ingredients to well-oiled crockpot (use coconut oil) and stir well. Cook on low for 5-6 hours, or until cooked through. By now, most of us have gotten over to post-holiday blues and back to the rhythms of life with work and family. We’re in a special time of year. It’s a time where we think big for ourselves making ambitious plans for our next twelve months and dream of the possibilities. The most popular resolution is improving health, and we usually are usually ready to do that after the holidays are over. As tasty as the holiday goodies are, they leave us feeling bloated, heavier, lethargic and a little less on track with our goals than we'd like. Just to hare some insight, those new healthy resolutions don't have to be complicated, and they don't have to end before February even arrives. The key to looking and feeling your best is to keep things uncomplicated and simply focus on clean eating. In case you've heard the term "clean eating" but haven't quite understood what it means because it can be a loaded word -- clean eating is all about consuming healthy, whole foods and cutting out the processed junk. For me it’s a 90% plant-based diet Whether you’re ready to jumpstart your clean eating now or you’re wondering what it takes to get started, I’ve got super-simple steps for a no-fail progression into clean eating. What is motivating you from the inside? Your motivation can be anything….running in the Boston marathon next year or maybe you have seen first-hand the damage done by not eating healthy through the suffering of loved ones. Whatever it is that is motivating you to eat clean, bring it in your direct focus so you will be more successful in sticking to your clean eating plan. Motivation is best if it’s not on focused on losing weight for a special event. Although this is a usual goal for many, one can lose sight of their health, wellness and eating clean as soon as the event is over and revert back to their normal routine that leads to eating processed foods, weight gain, feelings of failure and disappointment in ourselves. Great incentives for clean eating can be desiring to experience amazing energy, feeling younger, looking younger, and reduce your risk for disease so you can age gracefully. Before you begin to change your daily diet (lifestyle) and dive into your clean eating journey, it helps to journal about what you’re eating currently before beginning. This way, you can truly see what you’re eating and look for patterns. After the stressful week at the office, you might notice you’re more prone to ordering pizza. Make sure you observe only and do not judge yourself for eating the whole bag of chip, greasy takeout, or a whole bag of semi-sweet chocolate chips (that was a confession from chocolate lover, yours truly). There is no shame in the game at all. Writing down your food intake is about witnessing your behaviors so you can change them and you can take steps to change them rather than falling into the same pitfall time and time again. When people make changes to things in their lives such as their eating habits, they can set themselves up for significant failures if they don’t take it step by step. That means that if you want to be successful in the long-term, you should tackle one or two new things every 1-2 weeks, so you have a better chance of sticking to it. Don’t just say you’ll stop eating desserts forever. Instead, set a goal of only eating one small dessert per week, and go from there to decrease it further. It’s realistic, measurable and very specific. If you desire to lose, verbalize or write down your goal. For example, state, “I will weigh 135 pounds by April 1, 2018.” From here you can break down the goal into action steps you can take on a daily and weekly basis. When April 1st arrives and you hit your goal of 135 pounds, you will feel like a rock star and on top of the world. Talk about feeling good- your vibrating high. Sadly, most American pantries are filled with processed foods. A good rule of thumb is to cut out anything that contains more than five ingredients on the label and anything unnatural should go. If you have a lot of unopened items, donate them to a shelter. We’re creatures of habit, every one of us. When we go to the supermarket, we usually follow the same path every time. Shake things up and head straight for the produce section. You really should avoid the majority of the middle aisles of your supermarket because that’s where those processed food pitfalls lurk! To be really bold, change the store you shop at and opt for health food stores and farmers markets. One of the easiest ways to dive right into clean eating is to prep your meals. Write down your recipes for a time period (two weeks to a month) which eliminates the daily decision of what to eat often leading to unhealthy options. Every Saturday, go grocery shopping for the week ahead. On Sunday cook your meals. Freeze what you need to and get it out later in the week when you’re ready to eat it. If time is a factor, look for crockpot recipes that require you to prepare the food in the morning and come home to a hot, delicious, clean and healthy meal every night. If you want a sustainable, healthy lifestyle it’s yours to live. As you’ve read, it’s all about taking small changes over time to create your healthy and clean lifestyle. I’m here to cheer you on every step of the way. Leave a comment below and let me know how you are feeling, and what you’d like to accomplish as your first step. I’d love to hear your plans.